First Deputy Prime Minister and Minister of Foreign Affairs of the Republic of Serbia Ivica Dacic paid a official visit to the Socialist Republic of Vietnam, from September 7-11, 2017 where he had talks with Prime Minister of the Socialist Republic of Vietnam, Mr. Nguyen Xuan Phuc and Deputy Prime Minister and Minister of Foreign Affairs Pham Binh Minh. In the meeting with Prime Minister of the Socialist Republic of Vietnam, Mr. Nguyen Xuan Phuc both sides noted that the comprehensive bilateral relations between the two peoples and states were developing to mutual satisfaction. 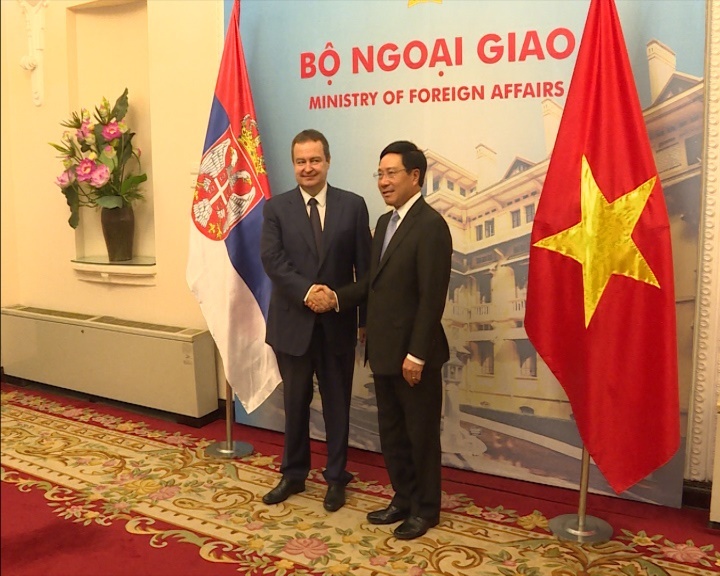 The Vietnamese Prime Minister underlined that the visit by Minister Dacic opened a new chapter in the promotion of political and economic ties between Serbia and Vietnam. He emphasized in particular both countries' potential for increasing the trade between them, as well as for technological development and modernization of production capacities. The Head of Serbian diplomacy and the Prime Minister of Vietnam agreed on and pointed out the importance of exchanging economic delegations, presenting the two countries' potential at trade fairs, and also of holding business forums as a foundation for further development of economic ties between Serbia and Vietnam. Prime Minister of Vietnam, Mr. Nguyen Xuan Phuc, also affirmed the strong support of Vietnam to the territorial integrity of the Republic of Serbia's as well as to respect for the principles of international law. The two officials also agreed on the importance of mutual support in international organizations. In an extensive cordial and friendly conversation with Deputy Prime Minister and Minister of Foreign Affairs Pham Binh Minh, the two Ministers agreed on the upcoming activities aimed at the expansion of bilateral cooperation and mutual support at the international level. Ministers Pham Binh Minh and Ivica Dacic recalled the decades-long friendship and cooperation between the two peoples and countries, that are also marking the 60th anniversary of the establishment of diplomatic relations this year. The Head of Serbian diplomacy informed his collocutor in detail about the current political situation in the Republic of Serbia, the course of reforms, and on the foreign policy priorities of the Republic of Serbia. The officials jointly recognized the need to promote the very good and friendly relations between the two states through the strengthening of economic cooperation and an intensified exchange of high- and top-level visits. It was also agreed to organize an economic forum with the aim of exploring economic and investment potentials of the two countries, while Minister Dacic invited his host to visit Serbia as soon as possible.